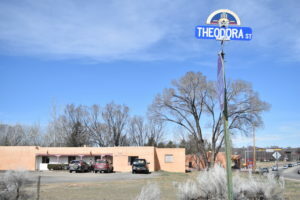 Visit the new NFO Wellness Center located at 428 Theodora Lane, Taos, NM 87571. The mission of the Not Forgotten Outreach “Wellness Center” is to provide a location for Military Families & Gold Star Families to receive free Complementary and Alternative Medicine (CAM). The goal of the NFO Wellness Center is to help reduce pain, Post-Traumatic Stress symptoms and improve overall quality of life by delivering non-narcotic, complementary care services as an adjunct to standard medical care. The unbelievable donation from Libby & Cliff Johnson of her parents’ law office building, which Howard and Helen Emily Brandenburg built in 1961, a back-burner program of NFO’s 5-year plan was able to move ahead of schedule. With numerous Veterans desiring to obtain CAM degrees, the majority of practitioners at the Wellness Center will be former Military & Family members. This will provide both augmented care to Military Families and economic development opportunities to Military Families in the wellness field. There are multiple volunteer opportunities available at the Wellness Center for certified practitioners to benefit the community or for anyone wishing to donate their time to a great cause.